Today, I am saying goodbye to toys. 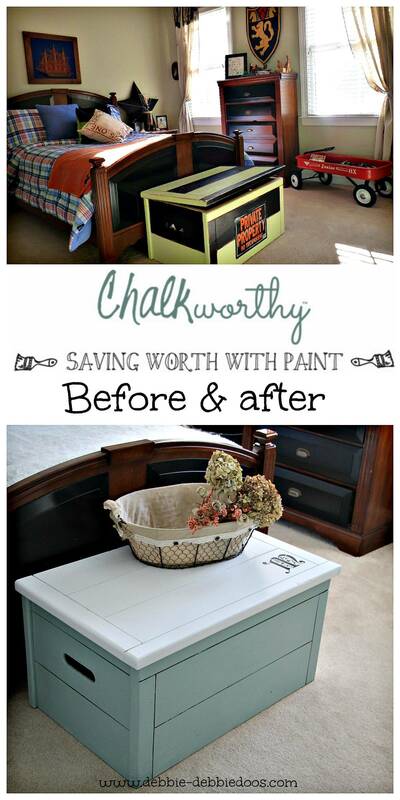 I am sharing a toy box makeover with chalkworthy paint. 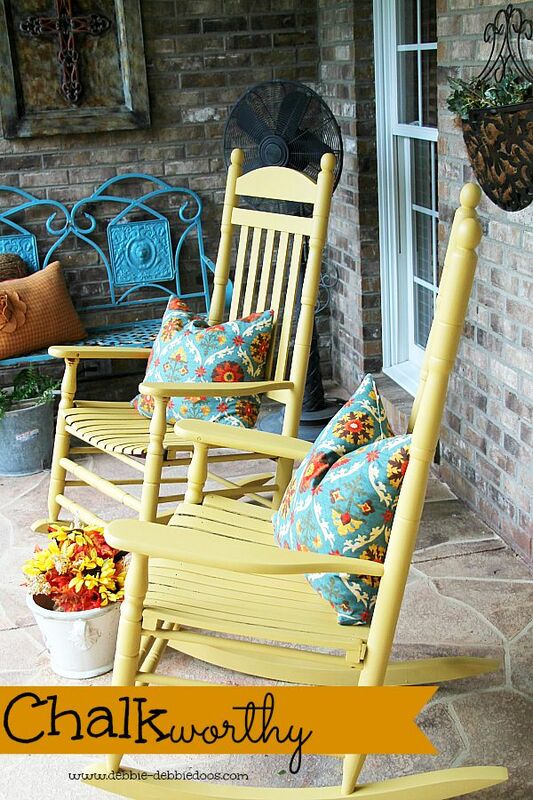 The very same paint I used on my rocking chairs on the porch recently. And for the record, I am saving all the toys for the future grands. Jack loved his legos! 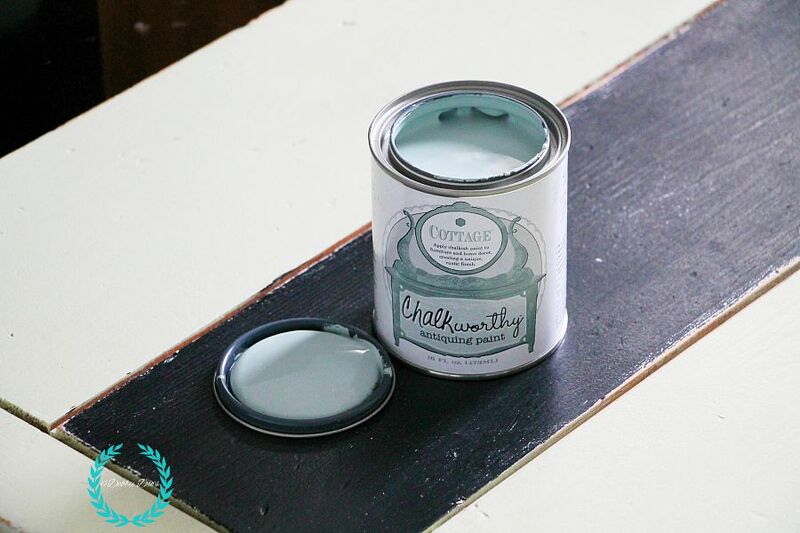 This is a sponsored post on behalf of Chalkworthy paint, prompted by me! So yes, all opinions are my own, always! This is actually the second makeover the toy box has had. Back in 2011 it went from Oak to this two toned funky makeover. This is actually a heavy tox box and constructed very well. I love that it can be updated according to the new room decor for my Mom and Alex’s unisex room. After this piece I can share with you the entire room. Finally, I know. I have been pretty slow at it these past few weeks. For this project I used two colors. First I did the entire piece in Cottage. After stepping back and analyzing the room, I decided I really wanted the white linen on the top of the trunk. I am so happy I made that decision. It only took me a few minutes to paint the top. The entire piece required two coats of paint and dry time in between each coat. Then one coat of wax to finish it off. I love it because you don’t have to prime or sand anything before you start. As you can see the original paint job was pretty dark and rustic looking. The paint covered very well. I have to say I am delighted the way the room is all coming together. Right now, I have it staged for Mom. 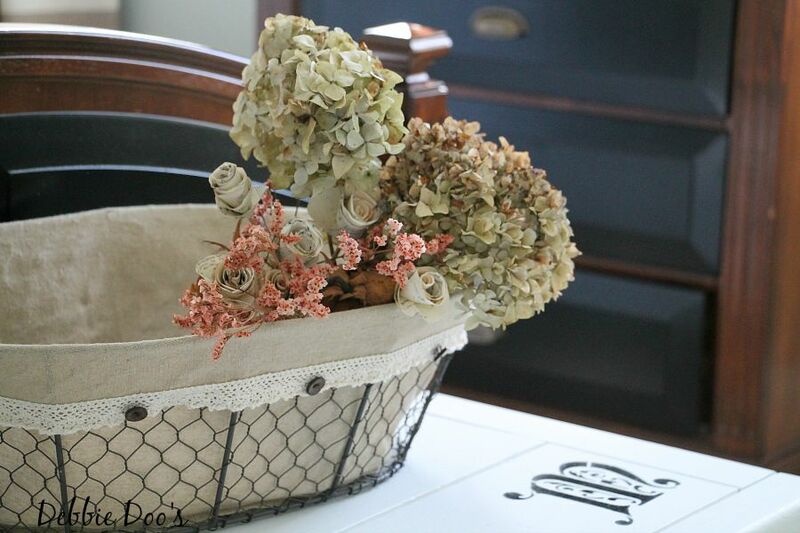 I am quite certain Alex would not enjoy the basket of hydrangeas and dried roses. When I share the reveal I will show you both ways I will be able to make it comfortable for the two of them while occupied. The Monogram is perfect. M for Mom, M for Manno our last name. I just wanted to add a little something, something to the tox box transformation besides just repainting it. I always feel like everything has to be accessorized in some way shape or form. 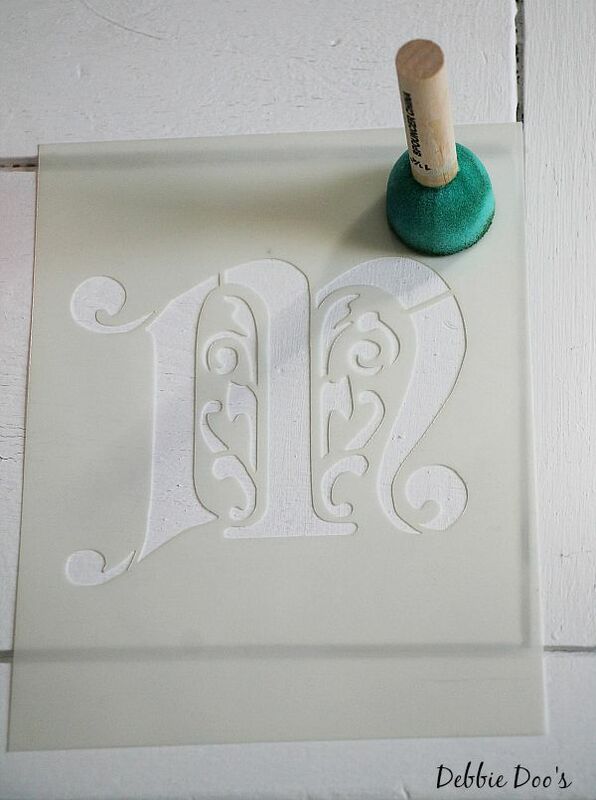 The monogram stencil I found online. I just googled monogram stencils and chose the one that caught my eye. It was only a few bucks! I am sure I will use it in the future on another project of mine. Pin it, and try it out! Thanks so much for stopping over today. If you are not a regular here, I sure would love to see you back again. very nice! I love that shade of blue with the linen. I have to say tho, I actually liked it the other way, it reminded me of Toy Story. where’d all the toys go? Yes, the first transformation was great too! However, I don’t think my Mom, nor Alex would care for it lol! I recently discovered chalkworthy paint- I’m in love!! Can’t wait to see the finished room! You make crafts every easy to do. Thank you for sharing. Toy Box is great! From utilitarian to gorgeous! Very nice, Debbie. That paint is terrific. I’ve been itchin’ to try some chalk paint ~ you make it look so easy. I’ve got an old desk that needs a transformation! Your room is coming together beautifully ~ can hardly wait to see the finish. Good luck Kelly! and thank you. Yes, when they head off to college it really is sort of sad. So happy you kept the toys and the box and it looks amazing. Yes, plenty of toys for the grands someday. I would love to try the Chalkworthy paint. I love the look of the results you got on your pieces. I have been a little nervous to use wax for the distressed looked. Hoping to get the courage to attempt on a piece of my own furniture soon. Thanks for all your inspirations and ideas.Have a great fall!! Interesting enough, the last two things I have painted, the rockers and this toy box I have not distressed them. I am sort of over that look for now lol. I was all prepared to say “oh no not the toys!” so I’m glad to know you put them away not sent them away. As for the paint, I’d paint something from my shed of shame that is full to the brim. No way could I get rid of them! Jack still loves to know they are there for his kids someday. Alex on the other hand could care less lol. Oh… what a little paint will do!!! Looks Great! Wow, did that ever turn out perfect. The Rockers as well. I would love to try the product. Covers beautifully. the chest looks great!! linen was a perfect color…and saving the toys a good idea also,,,my grandchildren play with dolls,animals and legos I kept from my children…good move! Love what you did with the toy box. I’m inspired and now I’m planning on doing the one I have sitting around here. The initial did it for me. Nice touch! Love the color combo and the monogram is an extra-special touch! I have an old toy box that I put away. This would be perfect for that project. The blue & linen color are the perfect combination. So restful AND excellent storage. Good job! Makes me want to find and old toy box and paint it. It looks very nice and I think the monogram adds the perfect touch. Thank you for another easy and fun project! Would love to win the giveaway, that paint looks amazing! I am working on an old sewing machine and I think this paint would be just what I need. I love the chest! I have an antique chest of drawers that I have plans to paint this fall – I would LOVE to win!!! It must be fun to recreate this space, I’m looking forward to the reveal. reminding me of ‘Toy Story’! That is so cute. Love it! I would love to try the kit as well. I would love to learn how to use chalk paint. I’ve read and heard about how easy it is to use and have a couple pieces of furniture that definitely need a makeover. Thanks for the opportunity to win a chalk paint kit. Looks great! I love how it covered the dark colors so easily! So pretty! 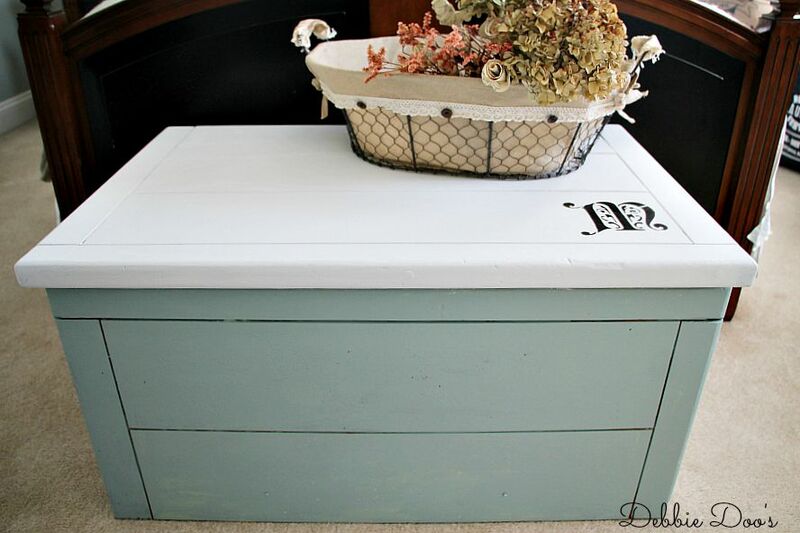 What a great idea to re-do the toy box! Thanks for sharing it! I would love to try this paint technique…I have not used it previously. I am thinking about re-doing an old side table made by my Dad some 60 years ago that I use everyday as a drop off point for keys and mail coming in from the garage. It could use an updating. Love your blog. You, dear lady, are an inspiration! I’m fairly new and do enjoy your site! Now could you share some gumption? LOL! Robin, I think I am using all mine up for sure. I LOVE the way the toy box turned out. I have a 3 piece shelf entertainment system I’m trying to figure out how to repurpose and paint and have been thinking of using chalk paint but just can’t make a decision! I think that is the way to go for sure! I would love to win a starter kit. Your chest is gorgeous and so is the rocker. I’m in the middle of “decorating by force”, our basement flooded so now it’s time for a total redo on a very tight budget, thanks to our insurance company. I’m trying to come up with furniture pieces that I can make look wonderful without spending a fortune. This would do the trick Sarah! Wow, Debbie, what a transformation and the colors you chose are yummy! Thanks for sharing and the giveaway! Love the makeover of the toybox! Brilliant idea Debbie and the color is perfect. Love the transformation! So pretty! I would like to makeover an old dresser for my daughter. I’m anxious to try this paint on an old very dark bookcase. What appeals to me most is the lack of prep time. Going over to look at colors now. Thanks for the opp to win some. 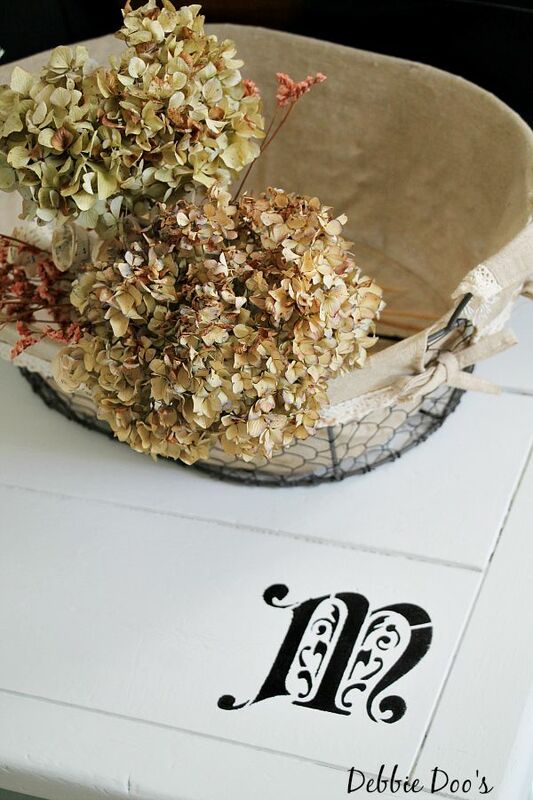 The paint colors you used are really pretty and the the monogram is a nice touch. Great repurpose! I really enjoy your blog. I would make over the cradle that my dad made for me when I was born. Thank you for the wonderful giveaway. The toy box has been given a new life and it looks wonderful! I’ve never heard of Chalkworthy paint. How have I missed it? 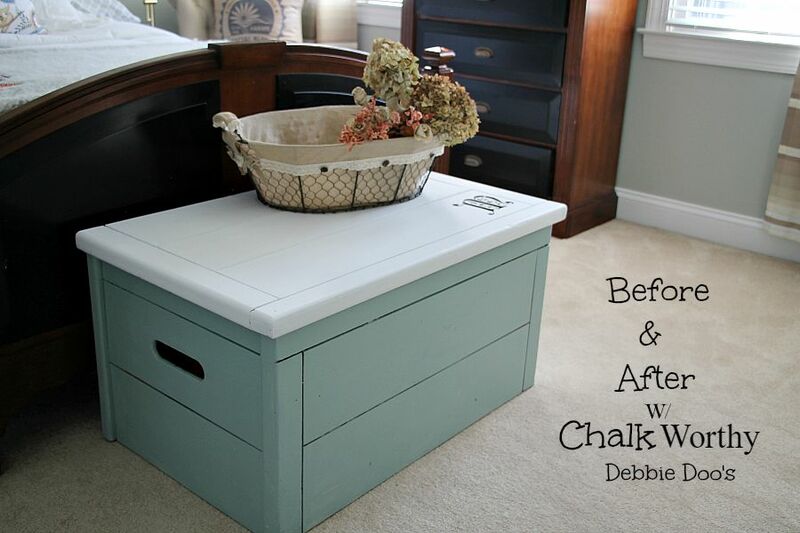 Love this transformation, Debbie, and the colors you chose for the ole toy box! That “M” stencil is great ~ I love the font. If you recall where you purchased it could you let me know? I’d love to see what the “P” looks like. I have two tray tables sitting in our sunroom that have been waiting for a makeover for two years now. I have so many projects to paint. I love that you don’t have to prime before you paint. 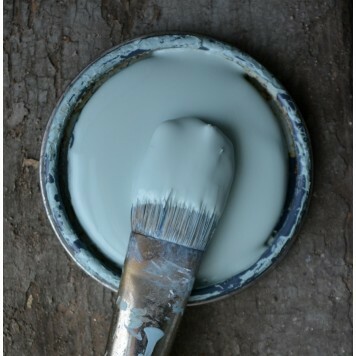 I have never used any of the chalk paints but I would love to try them. I have been wanting to try chalk paint. This would be a great way to get myself in gear and redo something. Beautiful transformation Debbie. I remember when you did the previous makeover. Would love to try this wonderful paint on a project. Debbie, the toy box is now very lovely; would never guess it was a toy box. Would this paint be good for a bathroom vanity? Need to do something with DARK cabinets. No sanding etc sounds great to me. Mom is going to love her new ‘vacation spot’. Oh absolutely Carol! Yes, it would be lovely on cabinets. Very nice paint and easy to use. Go check out their website too. You achieved a lovely result while making look like an approachable project. It makes we want to try this product some old twin beds for a guest room. Love the color choices. Very nice. 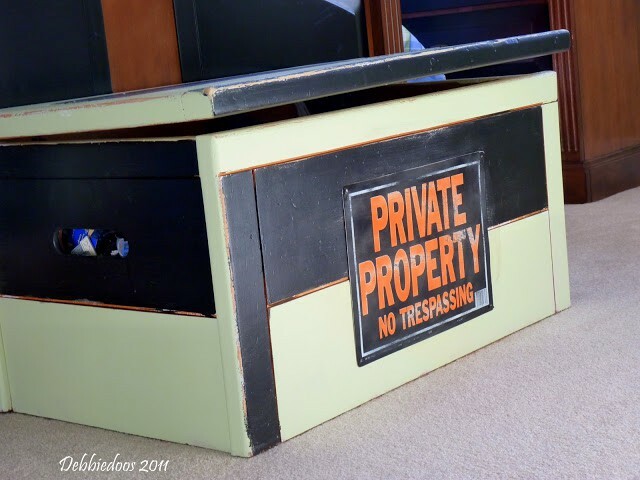 I love the makeover, it totally transformed the “mood” of that toybox into a guest room worthy addition. Great job!! I have an old family trunk I would love to do over with this paint. It looks so easy to use and I need easy! Found a fabulous caned headboard and bench can’t wait to see them transformed with Chalkworthy paint. Thanks for the inspiration Debbie! 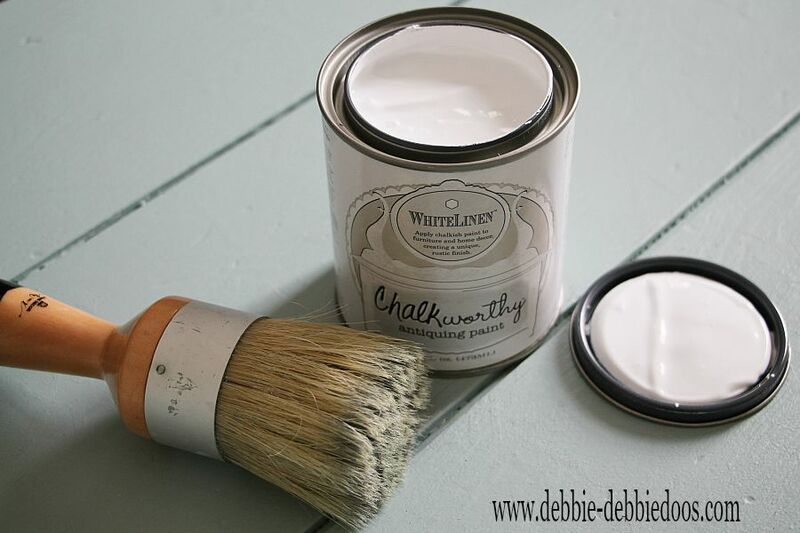 I love your project and would love to try the chalk paint on several projects.. Thank you for the giveaway. Love the transformation but like so many others, I liked it before too! Yep…I did too:) But it had to fit the new room style. I am soooooooo releived you didn’t talk about the toys for long because I was tearing up just reading your title!!! You did great Mom! Love the M!!! I always enjoy your posts. This one makes me want to tackle a wooden swing on our front porch. It was handmade by my late granddad, who gave it a nice coat of clear sealant years ago that is now peeling and needs to be removed. I haven’t been able to decide whether to try to restain the swing or paint it. This paint makes me think I COULD paint and wax it, and without making a mess of this special piece of outdoor furniture. Thanks so much! I’m enjoying your blog! I always have some project going on and I love the colors you used. I would use the same to spruce up a bedroom! Thanks for the chance! You tugged on my heartstrings. We have a HUGE tote of turtles in the attic. My oldest just turned 29 and my youngest son is 13…no more turtles here! 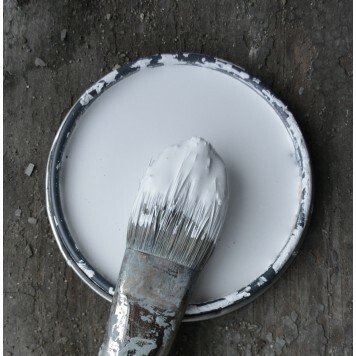 Love the makeover and have been wanting to try this paint on a repurposing project! Aw, I know what you mean. I have some toys saved for future grandchildren in the garage. Hope I get to use them sometime. Love what you did with the box! Love the transformation. Love those products you used. As always, you do such fun things, Debbie! This is a wonderful transformation. I am so glad you have kept the toys for the next generation. I held on to six or seven of the best & most fun toys ( and yes, there was a huge cloth bag full of legos), and my hubby was not happy that we moved those things several times, but I was insistent. The very first time I pulled those toys out for our first toddler grandchildren, we were both so happy that I had saved them. Who knows, they may get saved for great-grandchildren….but not for awhile, I hope!